Peeking out from under large floppy ears, the American Landrace pig is not only adorable, but popular with farmers and backyard breeders. Rated as one of the top five breeds for producing large litters of piglets with some of the highest birth weights, the Landrace also boasts one of the most efficient feed conversion ratios. Pay special attention to ensure your American Landrace pig gets proper nutrition and your pig will make the most of every bite. Good nutrition begins at birth. Even though Mom produces plenty of nutritious milk for her piglets, you should begin supplementing with pre-starter food served in a shallow pan when piglets are 1 week old, to ensure they get 18 to 21 percent protein. 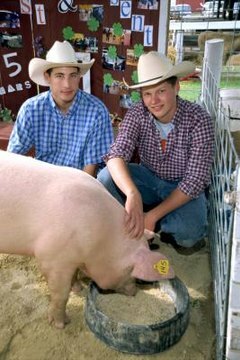 Adult Landrace pigs will fare well on a mix of grains that includes corn, barley, wheat and sorghum, or you can purchase a commercial food providing 14 to 15 percent protein. Supplement your pigs' diet with fresh fruits and vegetables for living enzymes. Dairy products such as milk or yogurt supply extra protein and help control internal parasites.